(18/P107) TRENTON – One of the largest land mammals ever to roam what is today New Jersey, the mastodon lorded over a lush, spruce-forested environment along the icy edges of glaciers before a warming climate and glacial retreat spelled its doom. Its fossilized remains have been found across the state, from the northwestern corner of Sussex County to numerous sites in the ocean as far south as Cape May County. A research paper released by the Department of Environmental Protection’s New Jersey Geological and Water Survey, in partnership with the New Jersey State Museum, provides the most-up-to-date report documenting mastodon fossil discoveries in the state. The paper, “Garden State Mastodons,” provides a short but fascinating compendium of the animal’s life and demise and offers information on some places where the public can see mastodon fossils. The New Jersey Geological and Water Survey documents more than 50 mastodon paleontological finds as far back as the early 1800s, including finds of pieces of bone, tusks, or teeth to nearly fully intact skeletons. Fifteen of New Jersey’s 21 counties can boast at least one find. The paper also notes that while mastodon fossils are available for viewing in several museums, others are housed in collections needing further conservatorship, a costly and time-consuming task in need of more funding. The mastodon became extinct at the end of the Pleistocene epoch, about 10,000 to 11.000 years ago. Its scientific name, Mammut americanum, comes from the Greek word for earth burrower because Middle Ages folklore maintained that these beasts dug into the ground with their huge tusks. In fact, they browsed on the twigs and cones of spruce trees prevalent during the cooler climate of the planet’s last ice age. The southernmost limit of the Wisconsin ice sheet ran along a jagged line through present-day central Warren and Morris counties, dipping south around present-day Morristown and cutting across northern Middlesex County. Mastodons are believed to have migrated to North America via the land bridge that once linked Asia with Alaska. The species of mastodon found in New Jersey was shorter and stockier than the woolly mammoth. It stood between 12 feet and 15 feet high. Unlike other mastodon species, the species found in New Jersey had a coat of fur, which was reddish-brown. Carbon dating places the age of New Jersey’s mastodon fossils from 10,995 years old to 12,730 years old. The most intact finds tend to come from the northern tier of the state. Browsing mastodons often became mired in the bogs along the glacial edge and drowned, their remains preserved by oxygen-deficient sediment. 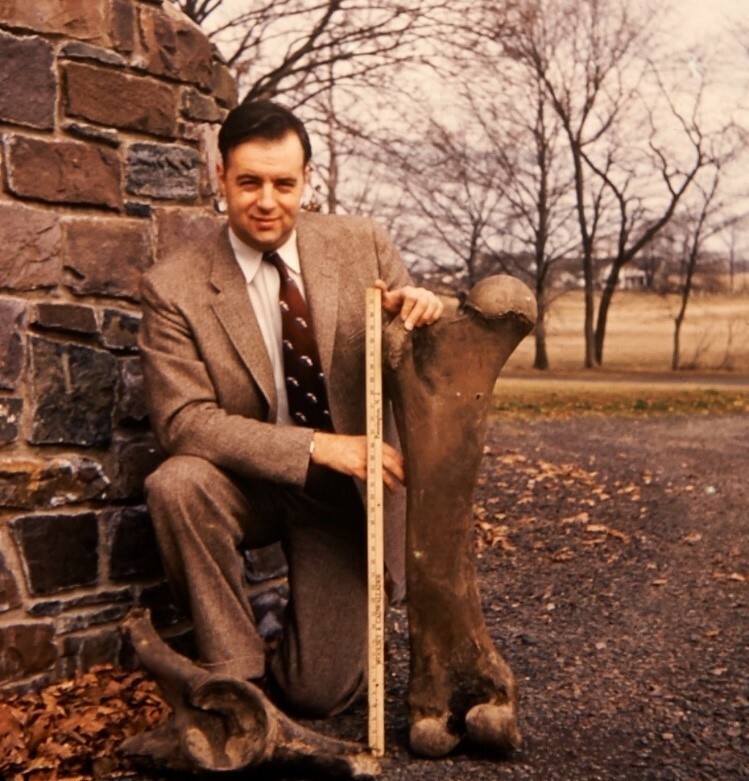 The Ohberg Mastodon, also known as the Miss Matilda Mastodon, was found in 1954 in Vernon Township, Sussex County, as farmer Gus Ohberg was having a pond dredged. “Can’t be a tree stump. It’s got teeth,” the dredge dragline operator Archibald McMurtry noted. Thousands flocked to farmer Ohberg’s milk barn to get a glimpse of the curious creature’s bones, one of the most complete sets ever found in the state. Farther south, away from the edge of the ancient ice sheet, finds tend to be limited to fragmentary bones and teeth because mastodon remains tended to dry up and scatter more readily in this drier environment. Nevertheless, another largely complete set of fossils was unearthed in Salem County over a number of years beginning in 1869 by workers digging for marl, a clayish sand. Visitors paid 10 cents each to see the mastodon in a large tent. This mastodon, known as the Mannington Mastodon, is now on display at the Rutgers Museum of Geology in New Brunswick. 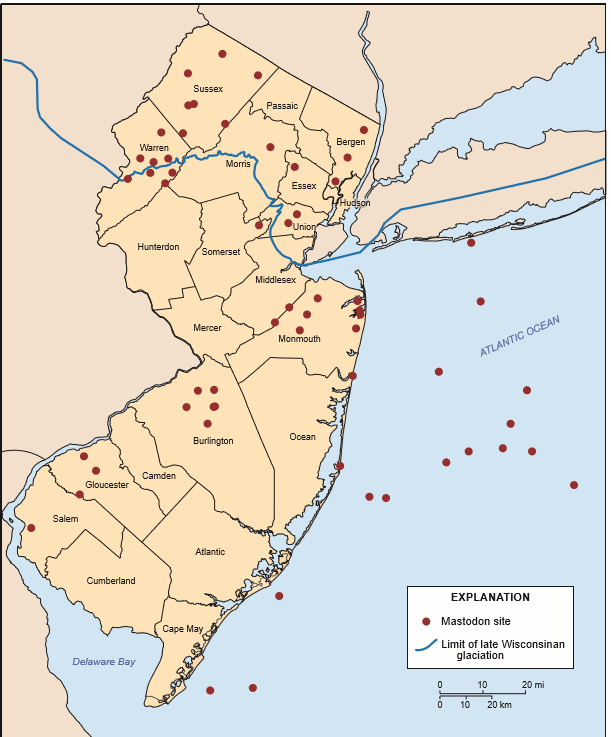 In addition, many sites where fossils have been found are scattered along the seabed from Monmouth County to Cape May County, with the largest concentration off Ocean County, as many as 60 miles offshore. Mastodons and other animals were able to inhabit these areas because sea level was more than 300 feet lower than today. The coastline was also 75 miles farther east. These fossils were typically brought up by scallop dredges. 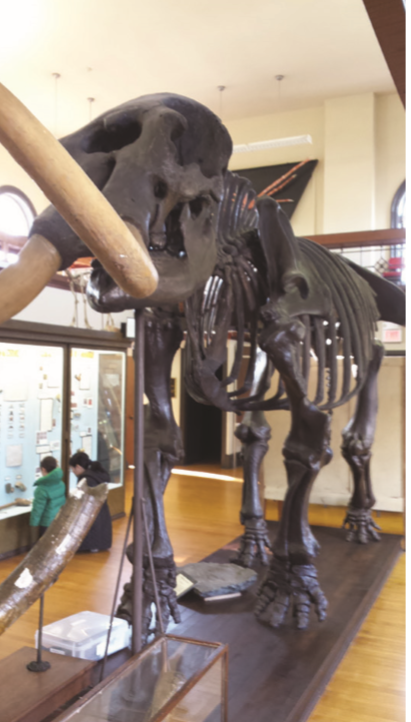 The Mannington Mastodon at the Rutgers Geology Museum is the only full mastodon skeleton now on display in the state. The Sussex County Historical Society Museum in Newton displays the skull and tusks of Moe, found in Hampton Township in 1962. Moe’s bones and teeth can also be found at the Newark Museum. The Newark Museum also has in its collection a 12,000-year-old mastodon skeleton from Warren County, though this skeleton is not currently on display. Bones from the Ohberg mastodon and the Bojak mastodon, found in 1971 in Liberty Township, Warren County, are part of the New Jersey State Museum’s collection, awaiting further conservatorship. At this time, the lower jaw bone of the Bojak mastodon and the skull of a young mastodon found in Holmdel in 2013 can be viewed at the State Museum.